Give yourself an advantage by learning these little-known facts about the behavioral evaluation methods they'll use on you not only in your interview — but also to determine who gets a raise, who gets promoted — and who doesn't. Here are some key terms and ideas that you need to know to help get yourself hired and advance your career in general. A personnel assessment procedure & interview technique that requires interviewees to give specific examples from the past where they demonstrated certain competencies, attitudes, knowledge, skills or abilities. Ok, so let's take a look at this definition, and how it can help you. In a behavioral interview, then, they are basically looking to hear examples (stories) from your past work experience where you demonstrated certain “competencies.” This is crucial for you to understand. In an effort to reduce the considerable expense of making bad hires, modern HR departments have become increasingly systematic in defining the specific competencies required for certain positions. Consequently, they’ll prepare your interview questions in advance, and design their questions to see if you can convincingly talk about your competencies in a way that matches the competencies that they’ve determined are necessary for a person to be successful in the role. The trick is as they won't necessarily tell you which competencies they are looking for! Go into the interview with an idea of the types of competencies they are likely to be looking for. When you are asked a question, think about it before you answer. What competencies are they really asking about with that question? Have 4 to 8 behavioral interview answers ready to go (see below) that speak to your competencies in certain areas. So what exactly is a "competency" then? A competency is “a measurable pattern of knowledge, skills, abilities, behaviors, and other characteristics that an individual needs to perform work roles or occupational functions successfully.” (Shippmann et al., 2000). A competency can also be defined as “an underlying characteristic of an employee (i.e., motive, trait, skill, aspect of one’s self-image, social role, or a body of knowledge) which results in effective and / or superior performance.” (Boyatzis, 1982). Or more basically, a competency is your ability to get something done. The right way. On time. Without making mistakes or aggravating other people. There are several different theoretical Competency Models in use by employers today. But in my job as a career coach I’ve adopted a modified version of the leadership competency model used by NASA, the OPM, and the US Defense Logistics Agency (DLA) — which is one of the largest and most complex organizations in the world. Most of the best HR and project management methods have been developed and perfected by these government orgs, or have been adopted by the government from the most successful American corporations, like Walmart. Their formal, research-based processes inform my theoretical approach and mental model for helping jobseekers like you to advance your career and achieve whatever it is you’re after. As an example of why DLA processes have to be so good, think of the staffing and advanced project management they need to have in place to do something like build the space shuttle. Or take Walmart, for instance, which has over 1 million employees. Think of all the expensive research they’ve done to put efficient HR hiring processes in place. You can benefit from their efforts and gain a personal advantage if you understand how these processes work. Hold on Bob, this does not apply to me! To understand these in more detail, review what I have written on activities you can do to show or develop your core behavioral competencies. You’ll notice the above list of core competencies is rather general. But under each item, there is a more specific set of competencies — such as problem solving, analytical thinking, interpersonal skills, planning and organizing, creative thinking, change management, motivating & inspiring, etc. Then of course there are various technical competencies unique to each job; like computer programming skills in a certain language, or the ability to do regression analysis for finance, or an understanding of how to segment customers in a marketing database, etc. These are occupation-specific technical competencies. That said, what you really need to know here is that their behavior-based questions are going to be aligned with one or more of the above core competencies, and your behavioral interview answers then need to convince them that you indeed have demonstrated these competencies in the past. This is how you get hired. Then they'll ask follow-up, or "probe" questions to expose your mindset, attitudes, and thought processes. Note that behavioral questions are about the PAST — they are not questions about what you MIGHT do given a certain hypothetical scenario. And that’s ok! You should look at behavior-based questions as AN OPPORTUNITY for you to demonstrate your outstanding competencies … and now you’re going to be ready to do just that! Describe to me your thoughts and feelings at that point. Why did you do it in that order? Walk me through your decision making process. How was the organization and its strategic goals impacted? Be a detective. Start by carefully reading through the job description from a “competency” standpoint. Using the above list of core competencies, try to determine which ones they seem to be looking for the most. What general competencies do they seem to be most concerned with? What technical competencies are being most emphasized? You can also look at The Competency Wheel to learn about more competencies by industry. Ok, so now write down what you have discovered. You should now have a list of the competencies you think they’ll be looking for in your interview. Great. Just by doing this, you’re already way ahead of the game. Nice work. Now, put your thinking cap on and go back in time. Start thinking about times on the job when you’ve demonstrated the competencies that are on your list. Keep in mind that your Accomplishment Records can be sourced from your hobbies, church group, or volunteer work as well. As long as the story is relevant to their question and shows an advanced level of the competency you think they’re looking for, then you can use it. I’m sure you are familiar with the STAR Statement answer format (Situation / Task / Action / Result) — but I want to share with you another formula that in my opinion is a bit stronger, because it incorporates what you LEARNED as part of your answer. What was the problem, challenge, or situation you faced? What specifically did you decide you were you trying to achieve to fix the situation, and how did you determine that this should be your objective? Based on your objective, what did you do? How did you arrive at and evaluate different possible alternatives? What course of action did you take, and what did that require? LEADERSHIP maybe? (hint hint) or TEAMWORK, or WRITTEN COMMUNICATION perhaps? What learning did you take away from this experience, and how did you apply what you learned going forward? Did you teach other people something new based on what you learned? Did you positively impact changes to department policies, or align more with the defined strategic objectives of your company? 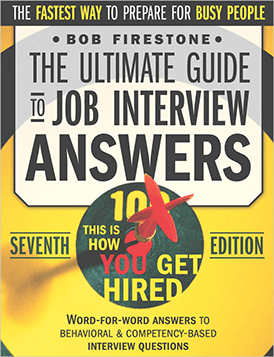 SO … TO BEST PREPARE for your interview it’s critical that you come up with 4 to 8 of these SOARL-style behavioral interview answers — and here’s a tip: Try to think of at least one story that had a negative or undesirable outcome. You might be asked about a situation you couldn’t resolve favorably, and what you learned from that experience. This might seem like a lot of work, but it’s so worth it! You will be much better prepared to have a good interview and get hired, and you are also creating miniature “elevator pitches” that will be useful for you for the rest of your business career. — You should now have a list of competencies you’ve determined they are probably looking for, based on your analytic reading of the job description. — You should also have 4 to 8 SOARL stories ready to go, each demonstrating an advanced display of a specific competency. — What to do next: Re-write, perfect, and practice your SOARL statements aloud until you “own” them and you are totally confident delivering them.